It’s upsetting to see the news surrounding the aftermaths of natural disasters. In just four weeks, there have been hurricanes in Texas, Florida and up the coast, wildfires in parts of the West, mudslides in Sierra Leone, and a massive earthquake in southern Mexico. There are many government funded programs that help disaster zones, yet personal donations are nearly always necessary to meet all the needs. However, before you click that ‘Donate Now’ button, research as much as you can and be aware of phonies who prey on goodwill. Think it won’t happen to you? Every year after the National Weather Service releases its list of storm names, domain names such as “Irma Relief” or “Help Harvey” are purchased in hopes of fooling well-intentioned donors—and it works. The National Disaster Fraud Center reported the number of fraud reports went from 79 the week before Hurricane Harvey to 425 in the week after the storm hit. To protect yourself, be cautious of disaster-related or other charity/fundraising emails—they may contain attachments that track sensitive information, or links that point to malware-infected websites. Also, be aware that the scams don’t stop at the Inbox. Scam artists may try to contact you via other avenues, such as social media, calls, texts, and door-to-door solicitations. Refuses to provide detailed information about the charity. Uses a name that closely resembles a reputable organization. For example, the Cancer Fund of America sounds like the American Cancer Society, but the Cancer Fund of America is a known scam charity. Uses high-pressure tactics to make you donate immediately. Asks for donations to be paid via cash or wire transfer. Offers to send a courier or overnight delivery service to collect donation. Do a little research. Take the time to investigate the charity or fundraiser when considering a donation. A good place to start that research might be to head to a website such as Better Business Bureau’s (BBB) Wise Giving Alliance, Charity Navigator, Charity Watch, or GuideStar. Look at the numbers. One key piece of information to look for is the charity’s administrative expenses. Charity Navigator, for example, says any charity that spends more than a third of their budget on administrative expenses is simply not living up to their mission. On average, charities spend 10.4 percent of their donations on administrative expenses. 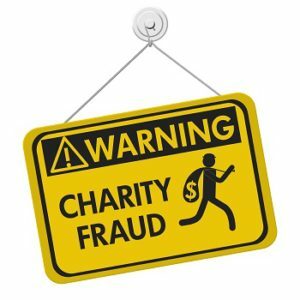 Be cautious of newly-formed charities. Even if a new charity is legitimate, it most likely doesn’t have the infrastructure to get donations to the affected area or people. Steer clear of crowdfunding. The Better Business Bureau warns that little vetting is done and it is difficult for donors to verify their trustworthiness and know where the money is going. Check if the charity is registered. The majority of states require non-profit and charity organizations to register before engaging in fundraising activities. Confirm if your state requires charitable solicitation registration or if the charity or fundraiser is registered in your state by contacting the National Association of State Charity Officials. Following a disaster, it’s easy to see photos or footage from the affected areas and want to give clothing and blankets to keep people clean and warm or food to feed the hungry. In reality, money is probably the most effective gift. Money allows the charities working on the ground to purchase the supplies they need to address the ever-changing needs of those affected. Although monetary gifts are most helpful, never wire money or send cash. This is often the preferred method of payment for scammers, as wiring money is like sending cash. Once it’s sent, you can’t get it back. Also know that charities will never ask for your Social Security Number or bank account routing information to accept a tax-deductible donation. Making a gift in the short-term is important for addressing immediate needs in the disaster areas. However, recovery efforts after a disaster can take many months and, in most cases, years. Consider becoming a partner in the recovery work. After a few months, check in with the organization you choose to support. Find out how their needs have changed and how you can continue to support them. Submit a charity scam or fundraiser Do Not Call violation complaint to the Federal Trade Commission. Links to external websites are provided for informational purposes only. TDS does not endorse a particular charity or credit monitoring service.